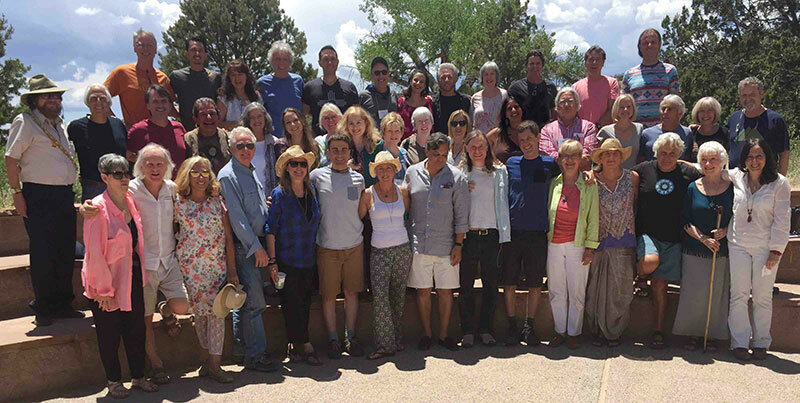 The 2016 Evolutionary Leaders retreat was a Co-Evolutionary Vision Quest held in June at the legendary Ghost Ranch amidst the ancient red rocks of northern New Mexico. This pristine wilderness is a place of great power and beauty. Centering ourselves between Earth and Sky in the unified field that embraces us all, our intention was to support the evolution of consciousness by listening deeply, attuning within and together to the wise counsel present in the universe, in nature, and in the creative impulse eternally flowing from the sacred source of life itself. We dedicated this time in loving service to all our relations. Something magical took place in the sacred valley of the high desert, among the rocks, the skies, the stars, and the land at Ghost Ranch. Perhaps it began as we prepared for the journey or the moment we entered the majesty of the red rocks north of Abiquiu. Or perhaps it was the moment when Gregg Braden was explaining about the resonance of the heart - and a hummingbird flew through the Long House! Whenever it began, it touched us all. Our Co-Evolutionary Vision Quest was a time of, in the words of Kristin Hoffmann, "a surrendering to a deep communion together through the ritual preparations, the solo questing on the land, the authentic sharing of our experiences, and the emergence of a more coherent sense of community." Organizers Diane Williams and Deborah Moldow, co-directors of the Evolutionary Leaders Circle, want to acknowledge the generosity and commitment of our amazing retreat team, each of whom contributed so much to the container of wisdom and caring that held us all: Gregg Braden, Joan Borysenko, Connie Buffalo, Jude Currivan, Gordon Dveirin, Lynnaea Lumbard, Oscar Miro-Quesada, John Perkins, Llyn Roberts and Daniel Stone.